Nevanac is a nonsteroidal anti-inflammatory drug (NSAID). It reduces pain and inflammation in the eyes. It is also used to reduce pain and swelling after cataract surgery. One should not use Nevanac if you are allergic to nepafenac. It can be proved as a great pain reliver to the person who is having inflammation in the eyes. As a non steroidal anti-inflammatory drug, the Nevanac is prescribed to the patients for extreme pain and irritation in the eyes. The eye drops help in reducing the eye pain and swelling that comes after a cataract surgery. To shop Nevanac 5 ml eye drop online conveniently, you should directly visit our pharmaceutical virtual store. 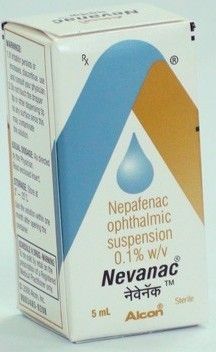 We are offering the nevanac 5 ml eye drops at the best market leading prices. Before buying, you need to ensure that you are not allergic to Nepafenac. If there is no such allergy, then you can take these drops for reliving eye pain and inflammation easily. To shop nevanac 5ml eye drop online, clients can login to our portal and place orders in any quantity.